Known as a romance stone, Rose Quartz can be used to attract love. 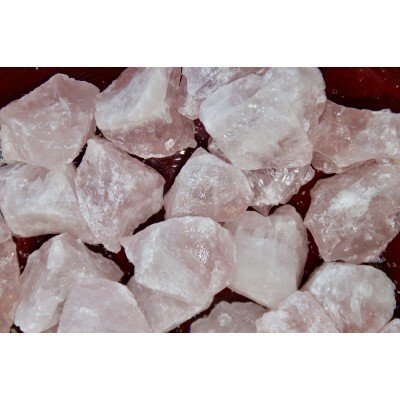 Rose Quartz clears out anger, jealousy, and resentment of others. This crystal can lower stress allowing clearing of heart issues associated with holding on to negative emotions. Protection from Negativity, Intuition, Wisdom, Meditation, CleansingAmethyst is a powerhouse stone. ..
Manifesting, Meditation, PurificationClear quartz is the most versatile of gemstones for metaphysica.. Clarity, Creativity, Manifesting, VisioningTo manifest your dreams, you first need to know what they..
Patience, Self confidence, Boosts EnergyRed Aragonite, also known as Star Clusters, were named after..
Calms the soul, Good Luck charm, Releases aggression, Protection from EMFsAmazonite is a good e.. Stability, Prosperity, LongevityJade is a very lucky gemstone that creates harmony of the mind, body.. Positive Energy, Spiritual Connection, Deep Peace, Mental ClarityThe powerful vibration of Selenite ..
Intuition, Creativity, Communication Sodalite has strong metaphysical properties that can stimu..
Focus Calming Rejuvenating When confusion clouds your mind, rediscover your path with using the..
Love, Compassion, Addiction, Emotional ReleaseA stone dedicated to balancing the emotional body, its..